Tread Lightly, there are wee creatures about. This was going through my mind as I walked outside into the late afternoon sun. I was in the great windup for the evening march about town. Rack the SuperDog (TM), my faithful sidekick, needed to get out and explore the world, exercise his mind, and water a few shrubs. I was looking forward to seeing things around town after being cooped up reading accounting books all afternoon, and who knows what all else before that. Walking to the unreasonably brilliantly white mailbox, I bend down low, grab the post from their hiding place, and start looking at what was misdelivered. Two for me, 8 for my next door neighbor. Amusing, I'll have to walk it over to his box. I take one step and a cloud of Dragonflies lift from their perches in my grass. "Oh, yeah! It's an early wet season. Watch where I walk!" I am slowly treading through the turf across the front of the yard. Dozens of amber and brown gems are floating on the breezes, flickering lights as they go by. It was the third day after the first rains. 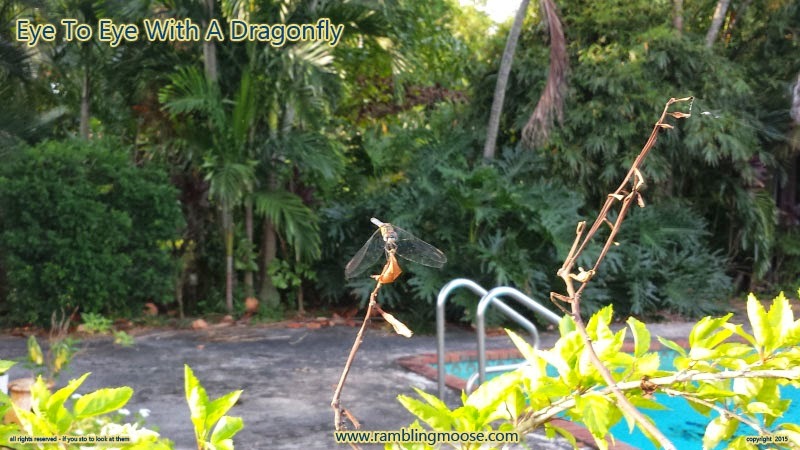 The Dragonflies lay their eggs in the lawn, going through their lives eating grubs that eat the turf, and generally being beneficial to man's way of life. The rains hit and they make the transition to their next stage of life that we all see. The timing is so that those pets that we all have and loathe so much, Mosquitoes, hatch and get out into the environment. About the only thing I can say good about them is that Mosquitoes feed the Dragonflies that I enjoy watching. Other than that I would love to put a giant Simpsonian Springfield dome over the city and fill it full of insecticides to kill the blighters off. Step again, another cloud rises. At this time I am seeing amber waves of Dragonfly wings rising and falling. I am in a cloud right out of a Disney movie, sparkling and fluttering on the breeze. Hundreds of them flying around me as I make my way East. I leave my neighbor his collection of junk mail, and head back. This time the amber is brighter as I head into the sun. Gently I make my way back to the house, enjoying yet another encounter with nature.